Read article (and view videos if they don’t display properly for you)�HERE. Celebrating your wedding at MacDonald’s may not be to everyone’s taste, but as newly-weds Steven and Emily Asher defend the unusual decision as “right for them”, we round up some of the more unusual venues other couples have chosen for their big day. Steven and Emily Asher married in a ceremony at Bristol Registry Office on Saturday before joining friends and family at a�McDonald’srestaurant for the wedding reception. 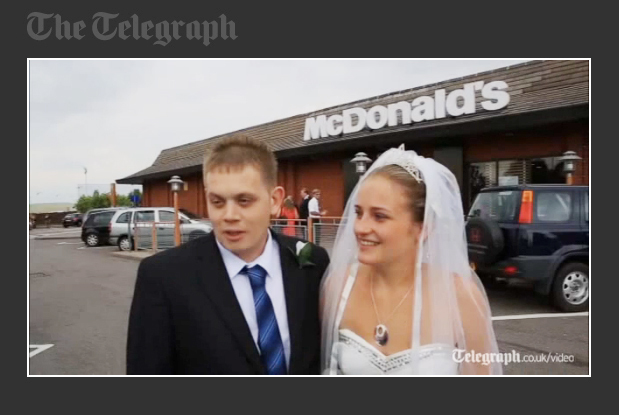 The 28-year-old groom, who celebrated his nuptials with a Chicken Legend meal while his bride tucked into a box of chicken McNuggets, said they chose the venue because it was his wife’s favourite food. While MacDonald’s may not be most couples’ choice of romantic venue, few would have a problem with the bill. The fast food reception for 33 guests in a cordoned off area of the restaurant set the pair back a meagre �150. Steven and Emily join a long list of couples choosing unusual locations for their big day. For more weddings out of the ordinary, read on for inspiration. Alberto dal Lago, 41, and Karla Munguia, 43, decided to take the plunge and hold their wedding underwater to raise awareness of the plight of endangered sharks. Wearing a white gown the bride floated next to the groom who sported a bow tie over his scuba outfit. The couple exchanged rings, signalled their vows and kissed before swimming to the surface. The pair met when Mr dal Lago, a scuba instructor, and Ms Munguia, a real estate agent, attended a dive and realised they both had a common love for sharks. A Swedish couple, go boldly where no couple has gone before with the first ever Klingon marriage ceremony at the ExCeL centre in London. Sonnie Gustavsson, 29, and Jossie Sockertopp, 23, travelled from Sweden to get hitched wearing traditional red Klingon wedding robes with matching prosthetic foreheads at the Destination Star Trek London event. The pair wanted to do “something different and romantic” and were inspired by an episode of Star Trek: Deep Space Nine, in which Klingon character Worf marries science officer Jadzia Dax. The venue for this wedding in Japan may have been rather traditional, but the priest was far from ordinary. This Japanese couple were married by a robot priest called the i-Fairy in Tokyo. The humanoid robot stands four-foot tall seated, complete with pigtails and flashing eyes. The happy couple, who both work in robotics, chose this unique ‘priest’ because they were keen to showcase an example of the new generation of androids. The 36-year-old bride said: “I think that Japanese have a strong sense that robots are our friends. Those in the robot industry mostly understand this, but people mainly want robots near them that serve some purpose.” Her new husband, 42-year-old Tomohiro Shibata, a professor of robotics at the Japanese Nara Institute of Science and Technology was a little more critical of the feminine android. “It would be nice if the robot was a bit more clever, but she is very good at expressing herself,” he said. In the US, Laurie Ann Phillips and Daniel Rosenthal took their relationship to new hights, tying the knot up the Empire State Building. As single parents, the two clicked while talking about their young children, and took an untraditional approach to their engagement by purchasing a house instead of a ring. Mr Rosenthal and Ms Phillips, who combined have four children, visited the Empire State Building last year with their families and wanted a symbol of the start of their lives together to be the famous landmark. They also wanted a wedding the whole family could remember. Getting to the church on time was not a problem for two competitors who got married during the 28th annual London Marathon. Rachel Pitt, 37, ran up the aisle with fianc�e Garry Keates, 44, after taking a half-mile detour from the route to become the first couple to tie the knot in a Christian ceremony during the race. The pair managed a quick wash before taking their vows at 3.15pm in front of 50 guests at St Bride’s Church on Fleet Street. Mr Keates, a fireman, carried his bride over the line at 4.50pm, seven hours and five minutes after the start. A couple made a grand entrance to their wedding in California by flying into the ceremony wearing jet pack systems. Grant Engler and Amanda Volf each wore �63,000 Jetlev R200 water-powered jet systems to greet their guests at the ceremony in Newport Beach. A daredevil couple married on top of the wings of two planes, 1,000 feet above the ground. Darren McWalters, 24, was strapped to the top wing of a biplane while his 23-year-old bride Katie Hodgson flew alongside on the wing of an identical aircraft � dressed in a traditional gown. Rev George Bringham flew ahead on the wings of a third aircraft and married the couple, from Lancashire over an airborne communications system. The ceremony, which was delayed twice due to bad weather, was played through loud speakers throughout RFC Rendcomb Airfield, near Cirencester, Gloucestershire, to the congregation on the ground. Be warned, though, not to fly too high on your wedding day, as Kerin and Jonathan Narcisse learnt to their peril. The couple had just exchanged their vows during a romantic sunset ceremony, when a gust of wind forced the hot air balloon’s pilot to make a crash landing. The entire adventure was documented by a member of the wedding party, Shana Pergande, who filmed it on her mobile phone. Luckily, nobody was seriously hurt. And for couples in the Philippines unable to afford a venue, there is always the option of joining a mass ceremony paid for by the government.